You should follow the steps accordingly to the synchronization type you want. A) Same playlist will play synchronously in all of the devices or video wall. In Sync Group field, no sync option is selected automatically. Change this field by selecting one of the rooms. Save, approve and make your playlist live. B) Different playlists will play synchronously in all the devices or video wall. In this case you will create a playlist for every device you would like to display synchronized content. To make it easier, you can name these playlists according to the order of your devices. Let’s start with the playlist of the first device. Go to contents section and create a playlist. Change Sync Group field by selecting one of the rooms. Then let’s create another playlist for the second device. 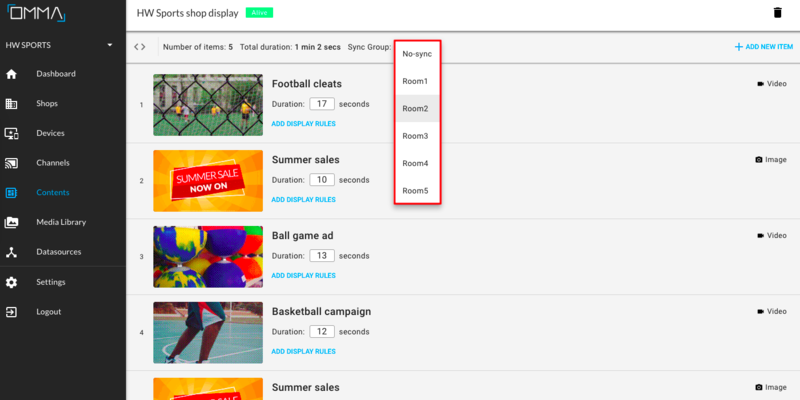 Change Sync Group field by selecting the same room on the previous device. Do this for every sync device in the same place. Pay attention to select the same room for all of them. C) I want to display parts of a video in my video wall. This is similar with displaying different playlists synchronously. Upload your video parts to the Media Library. Parts should match the number of devices you would like to sync. Create a playlist and upload the first part of your video. Redo these steps for every part of your video. Every part should be in a different playlist. Pay attention to select the same sync group in every playlist.